I'll be spreading holiday cheer--on foot--Sun. Dec. 16th at the Santa Hustle 5k. As you know, I'm in training for the Santa Hustle 5k, a running race being held Sunday, December 16th, 2012 at Cedar Point, in Sandusky, Ohio. Click HERE to see my first post about the Santa Hustle. 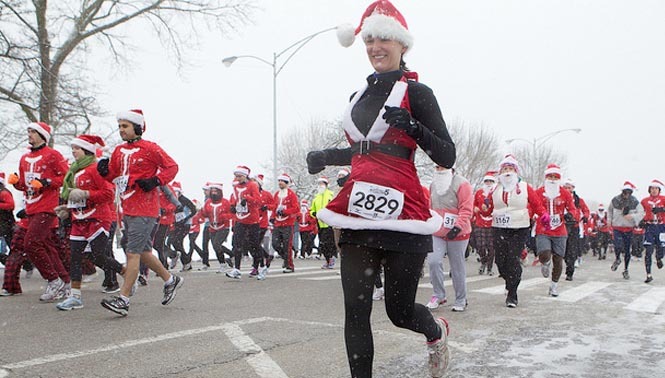 There are Santa Hustle races all over the country this holiday season including Chicago, Sevierville (TN), Indianapolis, Daytona Beach, Milwaukee, and Galveston. For more information and dates, check out their website: SantaHustle.com. You can also click on the Santa Hustle badge/link along the right-hand side of my blog for more information or for registration. I'm not just running the event, but I'm also an official sponsor. You can find me at the Post-Race Party in Sandusky, Ohio, congratulating all the participants. Not only will I be spreading Christmas cheer, I'll be talking to runners and their guests about their favorite Christmas episodes, specials and movies. If you'd like to check out my books, I'll have copies available at the party and I'll also be signing them, if you like. Either of my three books would make a fun gift for the pop culture fanatic in your life. Click HERE for the link to see the list of other official sponsors of the Santa Hustle. I'm in the red t-shirt and tube socks. My first race--The Firecracker Run 2 miler--July 4th, 1981. I haven't just been a Christmas TV fan my whole life, I've also been a runner. 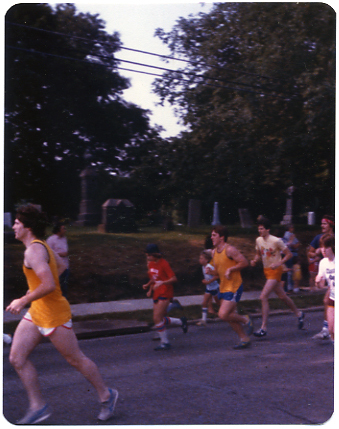 My first race was a 2 mile run on the 4th of July in 1981. I participated in 5ks and 10ks all through my high school years--even through college. During my twenties, I had spent some time racing my mountain bike and participated in multi-sport races including duathlons. By 1999, I began to realize the year 2000 was rapidly approaching--feeling "old," I decided to train for my first marathon. So I completed my first marathon in October, 2000 and followed this with training for triathlon. Pittsburgh Adventure Race 2002--2nd overall female. I LOVE this photo! I've just crossed the finish line of an ironman-length triathlon in 2003--I didn't have the tears to cry with joy. In the transition area during a triathlon, I'm putting on socks in order to start the run course. Sprint triathlon 2009. I had watched triathlon races on TV over the years--the Ironman World Championships in Hawaii were my inspiration--and in 2001, I completed my first sprint distance triathlon. This was followed by longer triathlons, and more off-road and multi-sport races. In September 2003, I completed an ironman-length triathlon (2.4 mile swim--112 mile bike ride--26.2 mile run). After the 2011 Warrior Dash--still dripping wet from rinsing off the mud. After the Color Run, June 2012. Since 2003, I have raced more for the fun of it. I still do triathlons but mostly local races with friends along side me. I've also caught the excitement in this new trend in racing: I've completed the Warrior Dash, Color Run, and Run for Your Life zombie run. When I first learned of the Santa Hustle which combines my love of Christmas AND running, I knew I wanted to be a part of it. I'm getting zombie make-up professionally applied at the Run for Your Life zombie run this past summer. After working as a zombie for three hours, I ran the 5k obstacle course. For all the time I spend on the couch watching and writing about television programs, I'm glad I have an active lifestyle. Even if you're not a runner, you can come and watch the runners in their Santa outfits (every participant receives a Santa hat, beard and t-shirt) to cheer and encourage them through the race. But don't be surprised if you catch the holiday spirit. I LOVE running in the snow! November 2008.